High dew points were also noteworthy as MSP tied the record highest dew point on November 4th with a reading of 55°F and broke the record high dew point on November 5th with a reading of 56°F. The high dew points prevented overnight temperatures from dropping to normal values for this time of year, so consequently some climate stations reported new record warm minimum temperatures on November 4th as well including 51°F at Collegeville, 47°F at Park Rapids and Alexandria, and 45°F at International Falls (tied record from 1956 and 2008). Scattered showers brought rainfall amounts ranging from 0.25 to 0.75 inches to parts of the state during the first week of November, following a wet last week of October. Soil moisture has been recharged in many areas with USDA Crop Condition reports documenting that over 80 percent of the state shows adequate to surplus topsoil moisture. Record crops of corn and soybeans have been harvested and been placed into storage. Farmers are waiting for soil temperatures to cool down before applying fall nitrogen. For those interested in famous Minnesota historical events I will be presenting the story of the 1940 Armistice Day Blizzard at a public event hosted by the Carver County Library in Chanhassen (7711 Kerber Blvd) next Monday night, November 9th at 6:30pm. This year marks the 75th Anniversary of this famous storm that paralyzed many areas of the state and killed a number of Minnesota hunters. I hope to see you there. For the second year, Climate Adaptation Awards will be presented to recognize achievements in leadership, education, research, policies, or practices that improve resilience and advance climate adaptation in Minnesota. We strongly encourage you to submit a nomination to recognize exemplary work by an individual, organization, institution, or the private sector. The submission process requires only a letter of nomination and two supporting letters. Nominations can be sent to Barbara Liukkonen, liukk001@umn.edu This conference promises to be an outstanding venue for disseminating results of your work, learning from others, and celebrating the accomplishments of Minnesota's climate adaptation leaders. Please consider nominating a deserving colleague or organization for an award. Another tropical cyclone formed in the Arabian Sea this week. Tropical Cyclone Megh is expected to grow in strength and bring rains to portions of the Horn of Africa (Somalia and Ethiopia) and Yemen along the Arabian Peninsula over the weekend and early next week. This storm follows Tropical Cyclone Chapala which dumped over a year’s worth of rain on portions of Yemen last week. The BBC and UK Met Office have joined forces to develop a nationwide Weather Watchers Club which shares their observations, data, and pictures of the weather over social media. It is a rapidly growing organization with users who file up to 10 reports each day. A joint study by the Hadley Centre scientists with the Chinese Meteorological Service has found that climate change is bringing a much higher probability for extremely hot spring seasons in northern China. Their research shows an 11-fold increase in the probability for an extremely warm spring across northern China as a result of increasing greenhouse gas emissions. The NOAA winter seasonal outlook for the Great Lakes Region, including Minnesota, is now available on the web and details expectations for temperature and precipitation patterns. NOAA announced this week a new graphics tool available for use with data from the National Snow and Ice Data Center. Using this tool you can examine trends in data such as the extent of Arctic Sea Ice on a seasonal basis, or the extent of North American snow cover. Some of the trends are quite interesting. 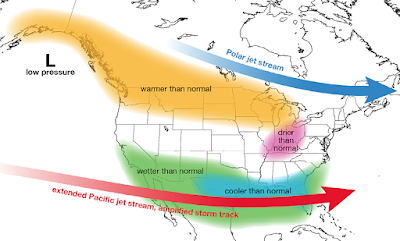 For those interested in planning for climate change resilience the North American Regional Climate Change Assessment Program (NARCCAP) provides access to some down-scaled data sets that may be useful for planning at the local level. The variety of data sets available is described in an online NARCCAP document. Recently NOAA scientists announced that they expect 2015 will be the hottest year globally for the record period from 1880-present, surpassing the previous record for warmth set just last year. But what has been the pattern so far this year in Minnesota? It hasn't felt like one of our warmest years to me. Minnesota has recorded a warmer than normal year so far, January through October of 2015, but no where near record-setting. The first ten months of the year rank close to 10th warmest in the last 120 years for Minnesota. It is likely that will still be the case by the end of the year, unless November and December temperatures depart significantly from normal. BTW the precipitation totals for the first 10 months of 2015 on a statewide basis rank as the 50th wettest year in history going back 120 years as well. The average MSP high temperature for this date is 47 degrees F (plus or minus 11 degrees F standard deviation), while the average low is 31 degrees F (plus or minus 9 degrees F standard deviation). MSP weather records for this date include: highest daily maximum temperature of 73 degrees F in 1893; lowest daily maximum temperature of 29 degrees F in 1873: lowest daily minimum temperature is 0 degrees F in 1991; highest daily minimum temperature of 53 F in 1975; record precipitation of 1.54 inches 2000; and record snowfall of 1.6 inches in 1933. Average dew point for November 6th is 29 degrees F, with a maximum of 56 degrees F in 1975 and a minimum of -5 degrees F in 1991. The state record high temperature for this date is 79 degrees F at Montevideo (Chippewa County) in 1934. The state record low temperature for this date is -16 degrees F at Moose Lake (Carlton County) in 1951. State record precipitation for this date is 2.15 inches at Pigeon River (Cook County) in 1948; and record snowfall is 12.0 inches at Cloquet (Carlton County) in 1919. An autumn rain storm brought widespread heavy precipitation to every area of the state over November 6-8, 1918. Many observers reported 1 to 2 inches of rain. Some southern counties reported over 2 inches. The warmest November 6ths in state history occurred in 1934, 1975, and 2001. In all of those years multiple communities around the state reported daytime high temperatures in the 70s F, with overnight lows in the 40s and 50s F. Even Tower (St Louis County), normally a cold spot in the state reached a high of 70 degrees F on this date in 2001. An early winter storm over November 5-7, 1947 brought heavy snowfall to many areas of central and northeastern Minnesota. Many observers reported 4 to 8 inches of snow. Babbitt reported 11 inches, Virginia 14 inches, and Litchfield 10 inches. Schools were closed in some areas of the state. The week following the famous Halloween Blizzard of 1991 was abnormally cold across Minnesota, bringing one of the coldest November 6ths in history. Sub-zero temperature readings prevailed across the state even as far south as Rushford (Fillmore County) where it was -2F. Most climate observers reported daytime highs in the teens and twenties F, while Ada (Norman County) rose no higher than 6F during the day. A slow moving low pressure system brought widespread heavy rains to the state over November 5-7, 2000. Most areas of the state received 1-2 inches of rain. That particular November the rain rarely let up, as it was the wettest November in Minnesota history. Many observers reported total precipitation for the month of over 4 inches, and a few received over 5 inches. Mostly sunny weekend with near normal temperatures on Saturday, then warming to above normal on Sunday with highs reaching the 50s and 60s F. Continued warmer than normal for Monday through Wednesday, then cooler with a chance for showers on Thursday.